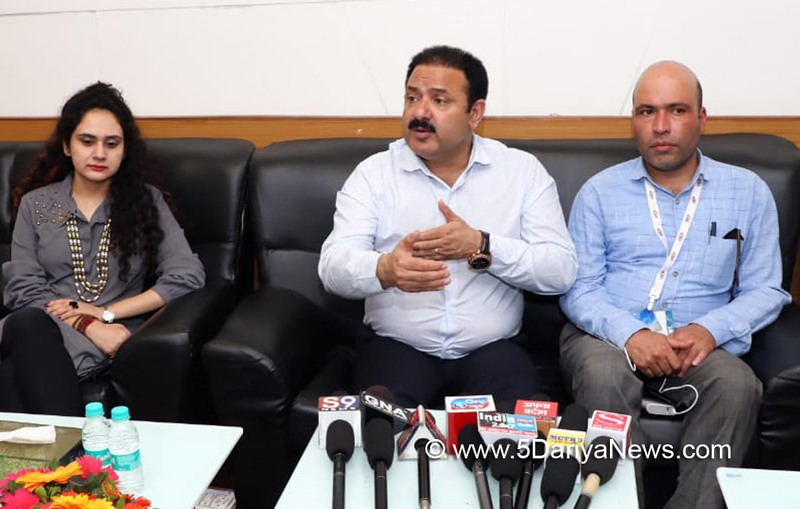 In an endeavour to boost the tourism through nationwide promotional campaign, the Department of Tourism Jammu & Kashmir participated in Travel & Tourism Fair (TTF) Ahmedabad where besides attracting a lot of trade visitors the Department was awarded for the best presentation.On the side-lines of TTF Ahmedabad, Director Tourism Kashmir Tassaduq Jeelani had an extensive interaction with the media fraternity of Gujarat and held meetings with leading tour operators of Gujarat wherein he highlighted the tourism potential of the state of Jammu & Kashmir. Tassaduq briefed the participants about diversity in tourism infrastructure of the State – ranging from Pilgrim Tourism for devotees going to Vaishno Devi and Amarnath to Adventure Tourism including Trekking, White Water Rafting, Snow Skiing, Mountaineering, Paragliding in addition to the Leisure Tourism. He also gave invitation to the national media to come to Kashmir and witness the upcoming Kashmir Festival (Kashmir Paryattan Utsav) in October. He assured everyone that J&K is a safe destination for tourists given the zero-crime rate against tourists and described J&K as the safest destination for women in the world.Tassaduq met the Chief Editor of Gujarat, leading newspaper of Gujarat Shreyansh Shah and discussed the tourism scenario of the State and highlighted the need for the media to play a proactive and positive role for the promotion of tourism in the State. He also mentioned the role of media to counter the negative perception so as to boost the tourism in the State of Jammu and Kashmir.Director Tourism was accompanied by Assistant Directors Nasir Mahmood and Rupali and tour operators and hoteliers from Jammu & Kashmir.